This is Earth, the third planet from the sun. I’m hoping, of all the planets, you’re most familiar with this one. Hopefully, though, you’re about to learn a little more about home. When seen from space, one of the most striking features of the Earth is all the water. Our planet’s surface is about 70% water. 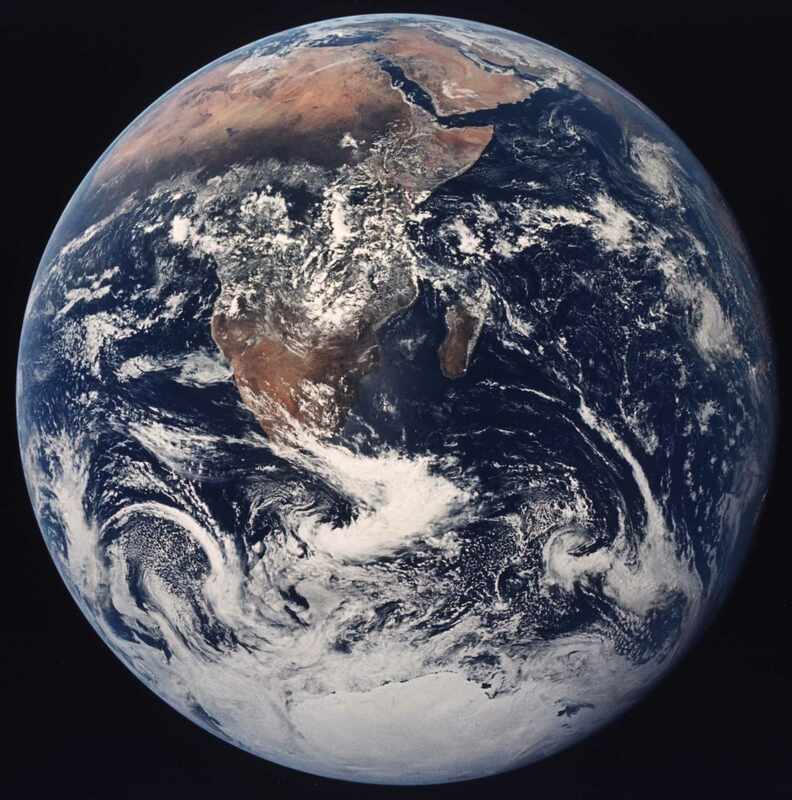 Earth is the only planet known with liquid water currently on the surface. Mars once had liquid water, and water ice is all over the place, but Earth’s water oceans are unique. The average temperature on earth is about 59 degrees F (15 C). Normally, at earth’s distance from the sun, it would be a lot colder, but we have an atmosphere to help us out. Just like Venus’ atmosphere traps heat and keeps the surface blazing hot, our atmosphere keeps the planet nice and warm. You might wonder what the big fuss about the greenhouse effect is, if it keeps us warm. The big fuss is, that if too much greenhouse gas goes into the atmosphere and traps too much heat, the planet will get too warm and many types of life will start to die. Even a few degrees increase can have major effects. 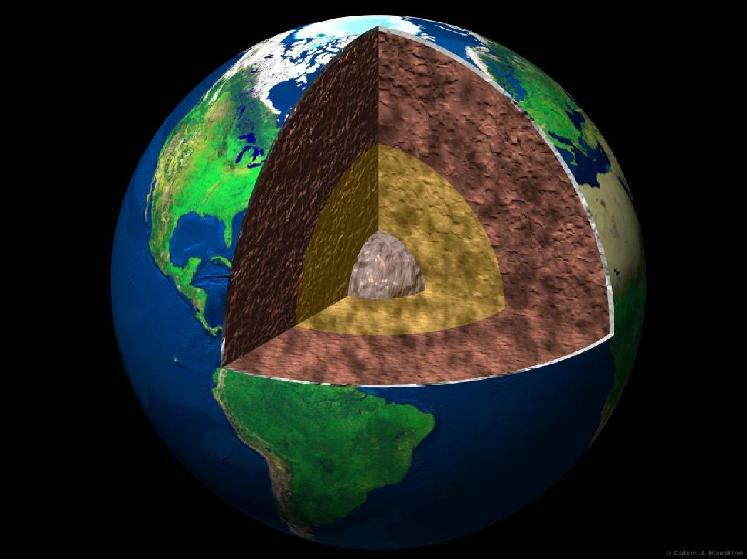 The earth has a core of solid iron and other heavy materials, surrounded by a liquid iron outer core. The core rotates inside the planet and creates a strong magnetic field. Outside the core is the mantle, a thick layer of hot (but not molten!) rock. Above the mantle is the crust, a thin layer of rocks. 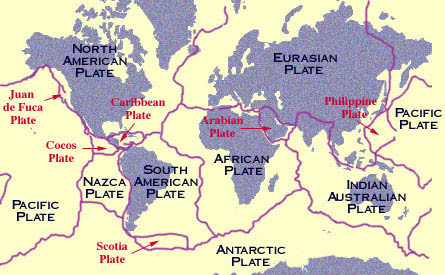 The earth’s crust is broken into “tectonic plates” which move around. When plates collide, they crumple up and form mountains, like the Himalayas. When the plates spread apart, magma oozes up from the mantle and hardens into new rocks. Earthquakes are caused when the edges of plates grind together, and volcanos are often found where two plates meet. Because the plates are constantly moving around, melting, and reforming, earth’s surface is said to be “geologically active”. That’s why the earth doesn’t have very many craters compared to the moon and most other objects in the solar system. Earth does have some craters though. 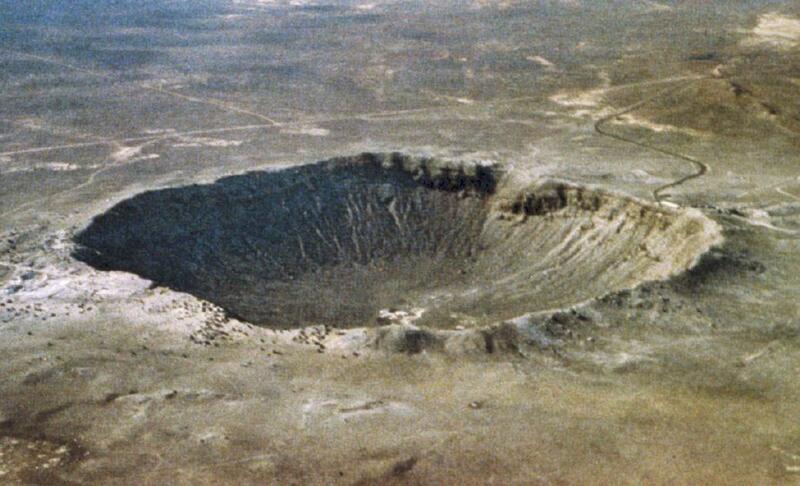 One of the most famous is the Barringer meteor crater in Arizona. This crater is almost a mile across and was made by a nickel-iron meteor about 150 feet across. The impact released the same amount of energy as exploding 20,000,000 tons of dynamite! From the surface, the earth seems like a pretty big place, but in reality, it’s a tiny speck. Here is a picture of the earth that was taken by the Voyager 1 probe in 1990 from a distance of 3.7 billion (3,700,000,000) miles. The earth is the tiny dot. The streaks across the image are scattered light from pointing the camera so close to the sun. Click the picture to read a quote about it. Venus is the second planet out from the sun, and is just slightly smaller than Earth. It is 12,102 km across, which is about 95% the size of earth. You can see Venus in the sky in the morning or evening as a very bright “star”. In fact, for a long time it was called the “morning star” or “evenstar”. It is always pretty close to the sun in the sky because it is close to the sun in the solar system. You might think, since it’s about the same size as earth, but is closer to the sun, Venus would be a nice place to live. It would be nice and warm, maybe the whole planet’s a tropical paradise! Let’s go! You might want to reconsider. Here’s why. About the only thing Venus and the earth have in common is their size. Venus is a really awful place. Try to think of the most unpleasant place imaginable, and I bet Venus is still worse. There’s no water on Venus, but it has a very thick atmosphere. At the surface, the pressure is 92 times the pressure here on earth. The whole planet is covered in clouds (that’s why is shines so brightly in the sky, clouds are pretty reflective). Not just any clouds though. 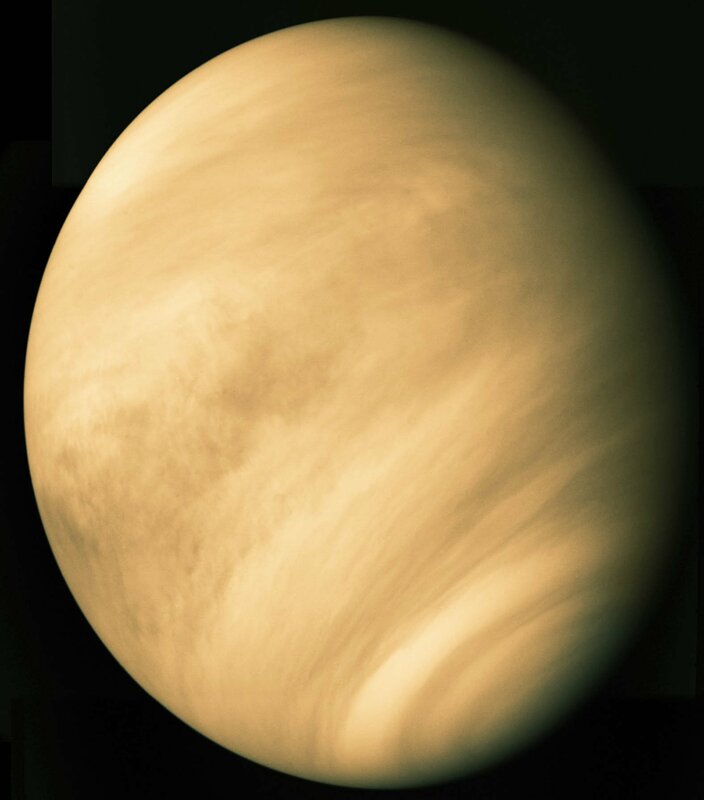 The clouds on venus are made mostly of sulfuric acid. As if that wasn’t bad enough, Venus is the hottest planet in the solar system. That’s right, even hotter than Mercury! The reason for this is the greenhouse effect. The atmosphere on venus is almost all carbon dioxide, the same gas that is causing climate change on earth. What happens in the greenhouse effect is, energy from the sun comes in and then gets trapped by the atmosphere and can’t leave. On venus, the surface temperature is 482 degrees C (900 degrees F!). Unlike mercury, it doesn’t cool down much at night thanks to the blanket of clouds. For a long time, nobody knew what the surface of venus looked like because all those clouds were in the way. Luckily, radar came to the rescue. Radio waves can go through the clouds easily. Radar works by sending out a bunch of radio waves, and then measuring how much gets reflected back. Several probes have been to Venus, and almost the whole surface has been mapped using radar. Here’s what it looks like underneath the clouds. Venus has a structure similar to earth. It has an atmosphere, and a thin crust. 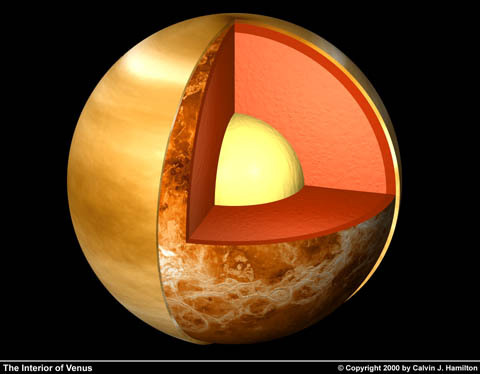 Unlike earth, venus’ crust is probably all in one piece rather than broken into separate plates. Below the crust is a rocky mantle, and a metallic core. Scientists aren’t sure whether the core on venus is solid or not, but it is probably about the same size as earth’s core, about 6000 km across. You might notice that, compared to mercury, venus has hardly any craters. Part of this is because of the very thick atmosphere. Stuff just burns up before it hits the ground. That’s not enough though. The lack of craters means that venus is geologically active, so its surface is pretty young. Venus has a lot of volcanic activity, 85% of its surface is covered with volcanic rock. There are huge lava flows hundreds of miles long and large plains created when lava filled low-lying areas. There are more than 100,000 small volcanoes and hundreds of large ones. The radar image below is of Sapas Mons, which is a very big volcano (250 miles across and a mile high). You can see lots of lava flows coming out from the center. They look bright because rough surfaces scatter radar waves better than smooth surfaces. Here’s an example of some of the thousands of smaller volcanoes. Each little bump in the picture is a volcano. 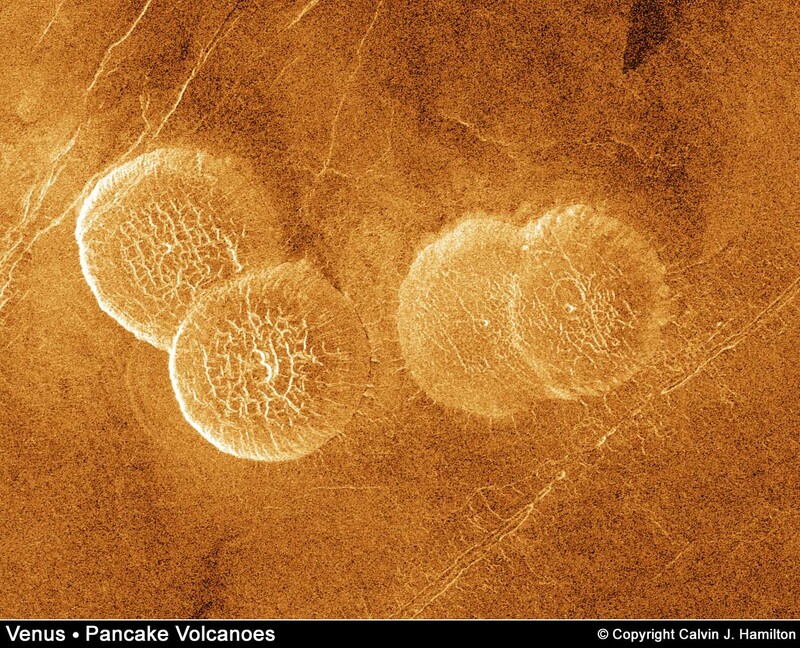 Here are four “pancake” volcanoes. 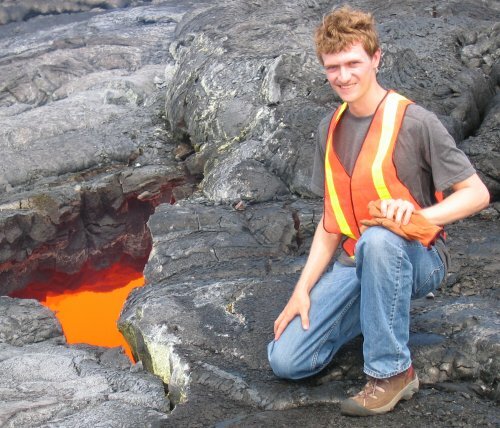 They form when thick lava oozes up from below onto level ground, and just expands in all directions. The pictures look distorted because of the type of lens used by the lander’s camera. The upper left and right corners show little patches of the sky. You can see part of the lander at the bottom, and the thing on the ground in the left picture is the camera’s lens cap. The rocks look like basalt, a volcanic rock found on earth. All in all, venus is not a nice place to be. It looks nice enough shining in the morning sky, but it just stands as another reminder that looks can be deceiving. In the future we will send more probes, but the chances are very slim that people will ever walk on its deadly surface.